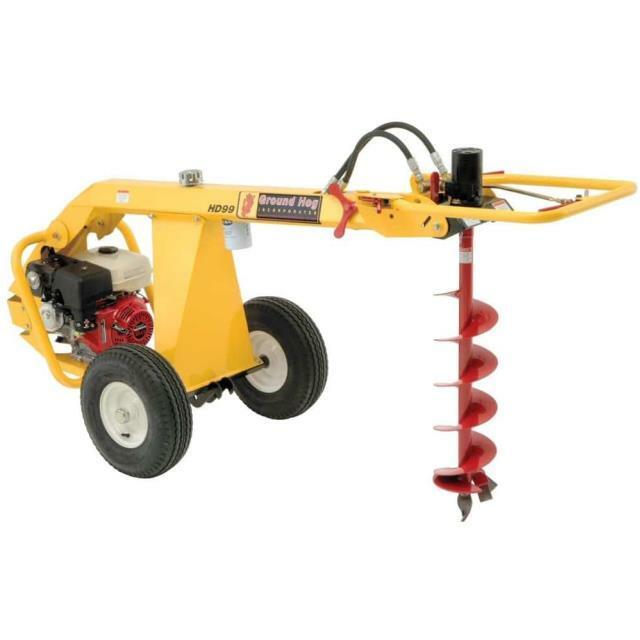 5.70 x 8 pneumatic highway rated tires; Forward and reverse auger rotation; Handle bar pivots for drilling on uneven terrain; 7/8" square auger drive to utilize your existing Ground Hog augers. Normal Drilling Length - 8'4"; Drilling and Transporting Length - 6'3"; Unit Height - 3'2"; Unit Width - 2'10"; Unit will go thru a 34" gate; Motor - 6 HP; auger speed 140 RPM with 200 ft. lbs. of torque. * Please call us for any questions on our digger hydraulic tow rentals in Dallas, Fort Worth, Arlington, Grand Prairie & DFW Metro Area.